Template files to give you ideas and help you get started. Going beyond the timeline, Swiftlight’s Activity or Project Summary view allows you to highlight objectives and deliverables / benefits by project (i.e. each arrow on the timeline), helping to focus planning and simplify benefits tracking. (Note: this view is customizable, so other categories of information can be displayed too). 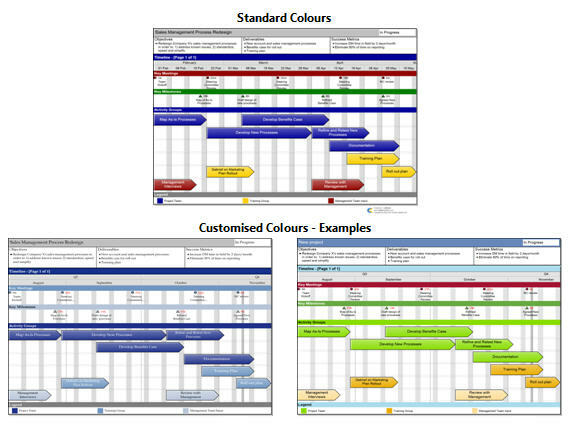 It’s a simple, practical combination which, in conjunction with Swiftlight’s six other views, gives the manager in a program management or PMO role a simple, visual tool which can enhance the ease of planning and executive communication, and save time in the process. 1) Quickly convert an MS Project file into Swiftlight, offering easier and clearer visualisation and communication of detailed project timelines and other project data. 2) Take a plan in Swiftlight and convert it into an MS Project file, allowing you to plan at a high level in Swiftlight and then export to MS Project for more detailed planning. To give you ideas about how to set up a program plan in Swiftlight and to help you get started, you can download the template files used for the examples above. (Note: in order to use these files, you will need to have a trial or fully licensed version of Swiftlight). Just click on the link to get these program plan templates. Swiftlight = Program Management / PMO Made Easy? No tool is going to solve all your program management / PMO needs, and Swiftlight is no exception. Process, people, structure, culture all play more important roles than any software, but Swiftlight is a simple, practical and flexible tool that can help make people’s lives in a program office or PMO a little easier – facilitating planning, the management communication that is so critical to success and saving precious time in the process. With its practical functionality, outstanding ease of use and all-round great value, Swiftlight should be an easy, low risk addition to the toolkit of anyone in a program or project management office. Why not see for yourself, and get a free 30 day trial?